At least there are a few other triathlons I can do before the season ends. 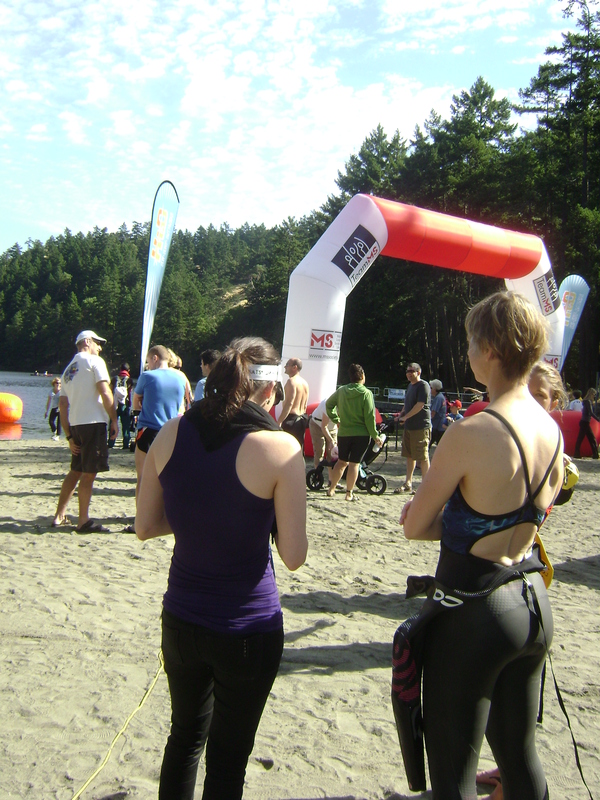 I think I’ll sign up for the sprint distance at the Subaru Sooke International Triathlon on August 7th, regardless. After all this training, I feel like I should do at least two this summer before marathon training starts! 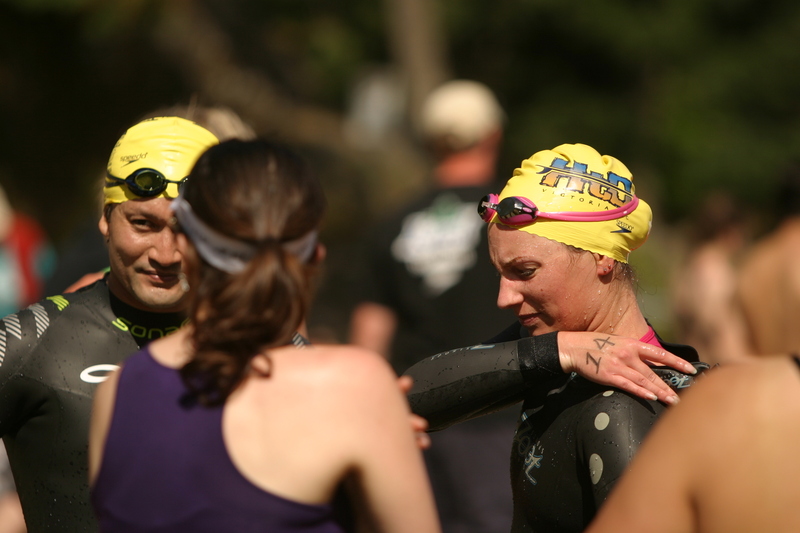 This morning I decided at the last minute to join the rest of my tri training group at the HtO Thetis Lake Swim for MS. I wanted to do it anyway (it’s for a great cause), but had to juggle some funds to afford the entry fee. I’ve spent a lot of money so far this year on race entries and gear, so I’ve been trying to cut back. But you know how it is… you can never have too many pairs of running shoes/shirts/shorts! I signed up for the 1.5 km distance, the distance of the Olympic distance swim in the triathlon. 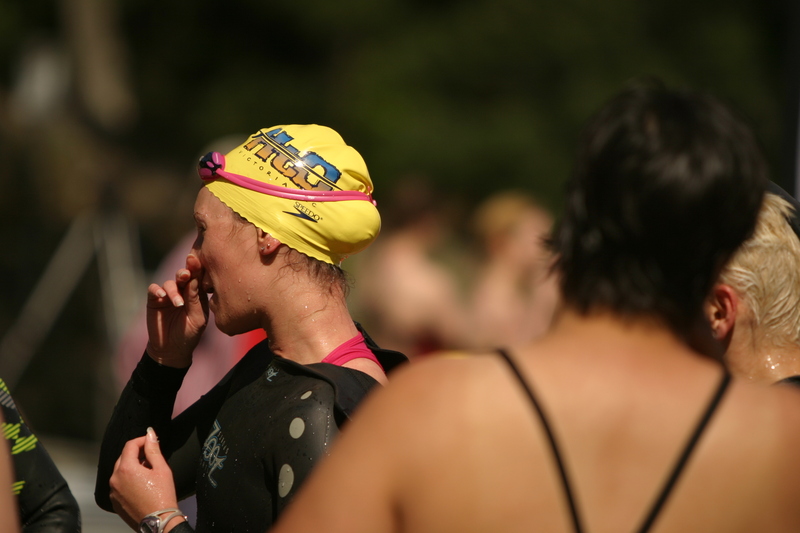 It was great to do a race start in the water and experience swimming in a group, with people grabbing at your feet and you trying to avoid being kicked in the face. I did okay though, despite getting a bit winded during my swim to the first buoy. I took a breather and slowed down, found my rhythm and just kept swimming! I did a sight every 30 strokes or so (as suggested by Jon – oh, and a ‘sight’ is looking up to see where you’re going in the open water), so I didn’t get too far off course. I finished in just under 40 minutes, which was about how long I figured it would take. I still had lots of energy left over – I felt I could have easily hopped on the bike right after for a 40 km ride! I think I’m ready. Seven more days!